Hi everyone. I decided to take a break from working on the house at the end of this week. Truthfully, I was suffering from a bit of "All Work and No Play" syndrome, so I just needed to go thrifting. A modest number of finds came home with me, though I must've left more than double this number at the thrifts for others to find. 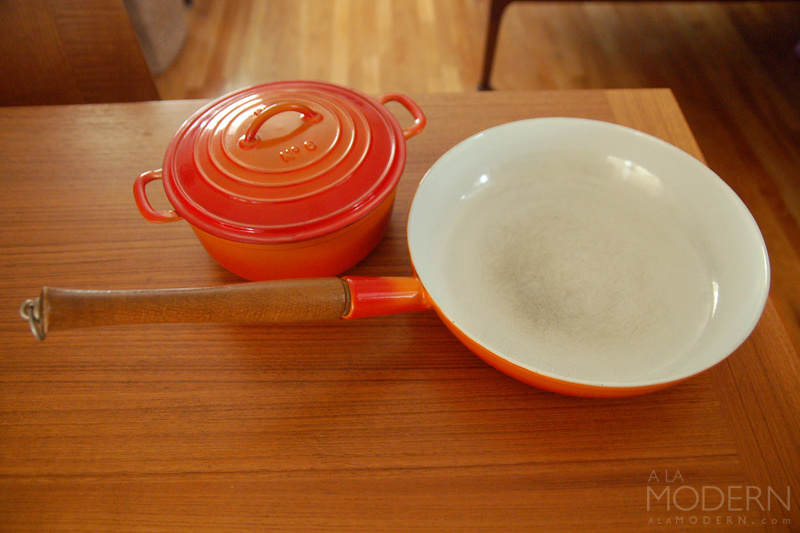 Descoware enamel cast iron cookware is fairly common at a few of the thrifts we visit. But I often pass because most thrifts have caught on and put high price tags (think $15 and up!) on them. Actually, the bigger reason we pass is because of the condition - invariably chipped or cracked. I can deal with carbon deposits, but enamel loss cannot be fixed. So I was happy to find these two Descoware pieces in such great shape! The small covered pot has almost no damage. I actually grabbed that one right out of the thrift clerk's "to-shelve" cart. Ususally, I refrain from doing that - but no one else was around. The frying pan is in pretty good shape too, with just some wear to the bottom. We haven't decided yet if we might keep either of them. 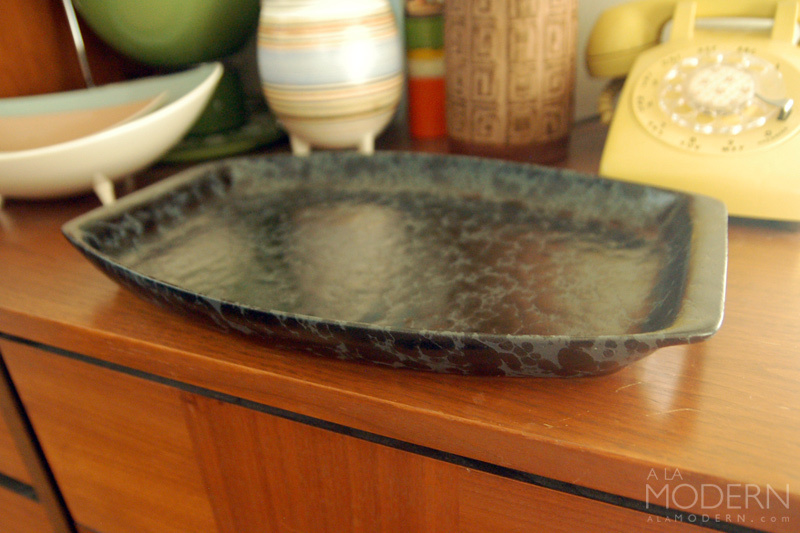 I hesitated on this Bennington Potters tray at first because it was so big, but we had some matching bowls in the shop so I picked it up. I heard that this color was called "Black on Slate" and has been discontinued. We're uncertain if this shape was a Yusuke Aida design or if it was by David Gil, or someone else. Bennington lines were often collaborations, so sometimes it's difficult to tell. 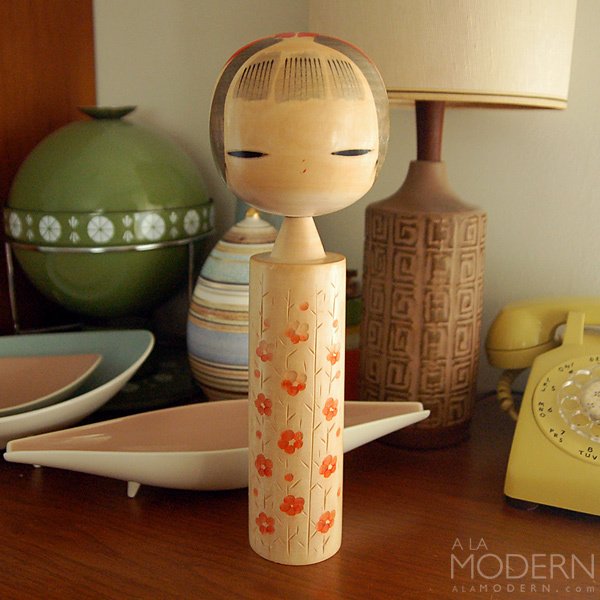 This wondeful tall Kokeshi doll was a surprise at the Goodwill. Most of the time we see kokeshi dolls, they're from estate sales or flea markets. We may keep this one since Linda has a collection of them, but we aren't sure yet. Funny, the cherry blossom design seems very similar to another one we found a little while ago. I've been trying to learn more about different types of glass this past year, but I still have a lot of trouble with ID-ing unmarked mystery glass. From what I hear, this is sort of common for other thrifters who don't specialize in glass. 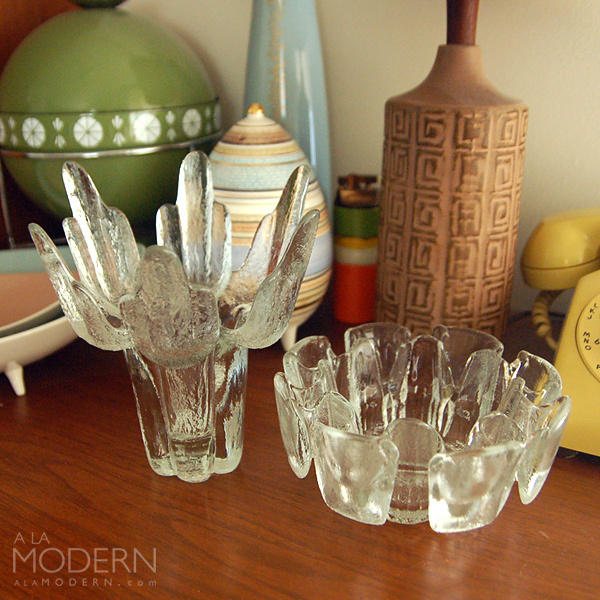 I thought these two fantastic "ice sculpture" style glass pieces might be Kosta Boda, but haven't been able to pin them down exactly. They're both similar to some of the Ann (or perhaps Goran) Warff pieces. Pretty cool looking either way. 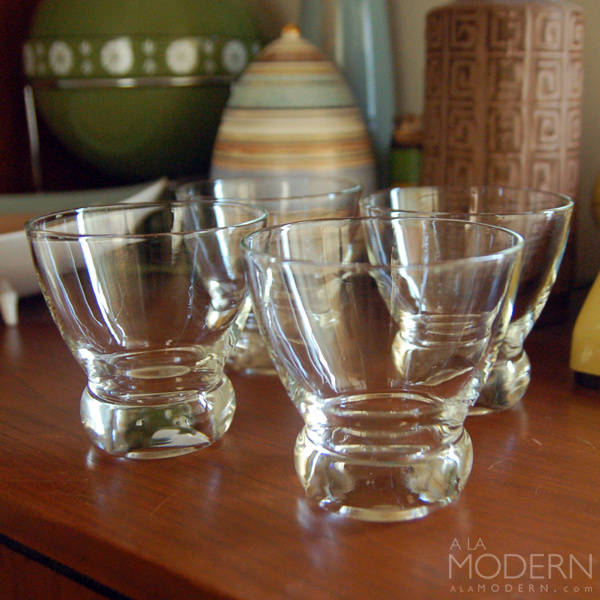 Lastly, I scored these four Federal "Prestige" old-fashioned glasses designed by Eva Zeisel. These aren't the smaller "Lo-Ball" style glasses - they're actually much bigger. I almost passed on these because I couldn't figure out why they were so big. (For some reason, I'd never found standard Lo-Ball glasses.) It turns out these are the harder-to-find Old-Fashioned glasses. As I've said before, glass isn't my strong suit. But I've slowly learned to recognize the Prestige items. We found (and sold) the juice glasses earlier. The key on these pieces seems to be the extremely heavy bottom, which looks and feels like a doorknob. I go by that first, and then look at the shape. If you make a mistake... well, it's part of the learning process. I've goofed many times myself.